Co-founder and editor-in-chief of Tech.eu, with previous stints at The Next Web and TechCrunch under his belt. Deeply in love with his family, technology, traveling and Belgian beer. Last week, the European Commission’ Startup Europe initiative organized the first Accelerator Assembly Conference in partnership with startup accelerators such as Seedcamp and Techstars, and organizations like Startup Weekend, Nesta and How To Web. In our ongoing quest to research how seed funds and startup accelerators are starting to reshape the European tech industry from the bottom up, we attended the conference and learned a lot. In one of the on-stage presentations, Jed Christiansen discussed some interesting findings of research carried out in relation to his work on Seed-DB, a global database of accelerators and their portfolio companies. Christiansen, who has a day job at Google in London, also shared a document with said findings with all of the attendees, and was kind enough to let me publish the highlights here on Tech.eu. The quantitative data for analysis came from Seed-DB, a worldwide directory of seed accelerators and programs, although additional research was carried out for accelerators based in Europe. 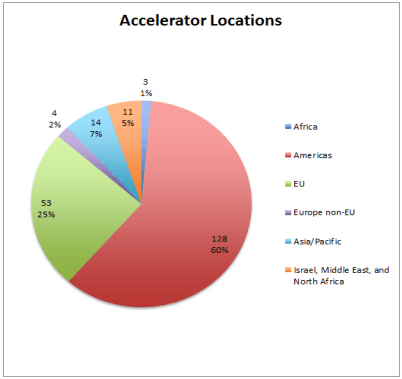 In addition, surveys were sent to accelerators: 20 responded, of which 17 were EU-based. – time-limited support (‘programs’) in the form of events, mentoring sessions, coaching etc. Based on this definition, Christiansen reckons there are approximately 200 active startup accelerators in the world today (we counted about 100 in Europe alone, while Christiansen’s list contains 57 EU accelerators based on stricter benchmarks for inclusion). According to the Seed-DB research, more than 20 percent of companies that have been funded by an accelerator graduated from an EU accelerator, or 738 out of a total of 3,600 ‘accelerated’ startups. Unsurprisingly, the data confirms that the large majority of accelerator ‘graduates’ are located in the Americas – more than 2,650 startups to be precise. According to Christiansen, most accelerators accept/graduate approximately 5-15 startups per class. Notable exceptions with far larger cohorts include the likes of Y Combinator and 500 Startups. Seed-DB correctly notes that it’s nearly impossible to estimate how many jobs are created by startups that came out of a seed accelerator, as there isn’t a decent data source that accurately keeps track of this, and because employment numbers shift quickly in the tech startup world (hiring and lay-offs tend to happen fasten than is usually the case for new businesses). That said, the little information that’s available on CrunchBase and self-reported by accelerators shows that European accelerators have generated at least 2,000 jobs. Obviously, this is much lower than the real number of new jobs created by startups. To wit, only 286 out of all 738 European accelerator ‘graduates’ identified by Seed-DB share employee figure data on CrunchBase, and even then much of that will likely no longer match with reality. Using known (self-reported) averages per startup, Christiansen estimates that the total contribution is actually closer to 3,500 – 4,500 new jobs in the EU. Moving on to the qualitative part of the survey, an interesting observation is that startup accelerators admit that they often don’t succeed in connecting their startups to bigger investors for follow-on funding – although this is often used as a carrot to get the best startups into the program. This could mean that the angel/VC community in Europe is simply not large enough, or not in tune with what happens in the accelerator space, or that the quality of startups simply isn’t there (i.e. not high enough to warrant ongoing interest from institutional investors). Another thing accelerators wish they could provide more of is support when it comes to scaling companies, namely recruiting new people, increasing sales and other types of ongoing business development. When asked, which percentage of their graduates were able to compete on a national, European and/or global scale, the answers were also quite remarkable. Thirteen accelerators believed 70-100% of their startups were able to compete in their respective markets on a national level upon graduation, and that 50-100% were competitive on a European scale. 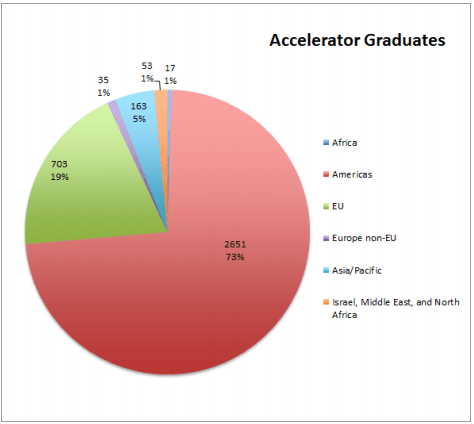 Two accelerators posited that the majority of their graduates (80-100%) were competitive on a global level, compared to 11 accelerators who estimated between 30 and 60 percent. In contrast, the remaining accelerators said only 10-30% of their startups could compete nationally, and a mere 5-20% in Europe. Notably, six accelerators said only 0-5% of their startups were able to compete globally.